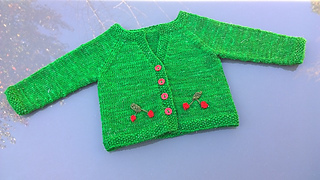 This little cardigan was inspired by one of my oldest and dearest friends. Her love of cherries and of the rockabilly era brought this design to light. She is currently pregnant with her first child, a little girl who I know will be as lovely and dear to me as her mother is. 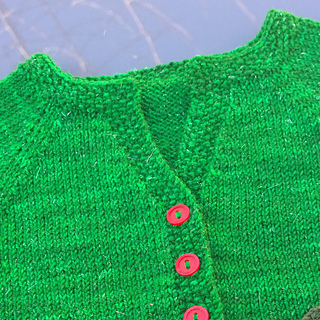 This adorable cardigan is a bottom up design with a moss stitch border. 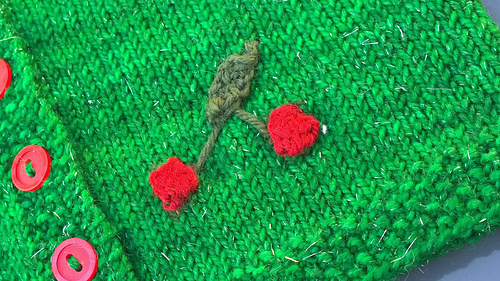 The cute little cherries are knitted into the sweater to create a 3D motif. The long sleeves are added in with raglan decreases and the button-up option will keep your little one warm. Advanced Beginner - you will need to know how to work in the round, read charts and work bobbles and buttonholes.